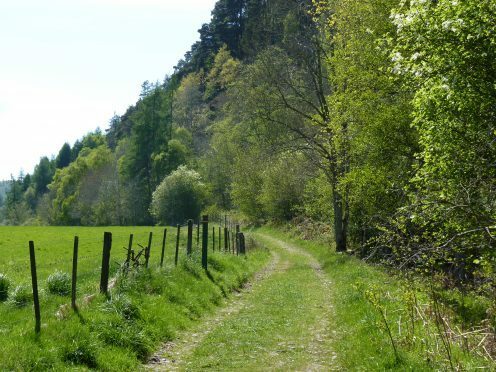 A 360-degree trail around Loch Ness – for walkers, runners, bikers and horse riders – is set for an influx of new visitors from the German and French markets who have been “screaming out” for something new in the area. Graeme Ambrose, chief executive of Visit Inverness Loch Ness, said talks with those in the international travel trade showed that visitors from the two European nations are particularly excited by the new route. The final section of the South Loch Ness Trail is due to be finished by August and will connect Inverness to Fort Augustus on the south side of the loch, linking up to the Great Glen Way on the north side. The £250,000 plans have been in the pipeline for more than four years, but the tourism organisation has now managed to secure funding and planning permission – and work started on the project last week. Yesterday Mr Ambrose said: “Loch Ness 360 is significant in terms of what could be delivered in terms of visitors. Hopefully, this will all be completed by summer, and certainly no later than August. “I know the long distance route market for walkers is growing and people who do these things like to tick it off their list. In terms of the potential impact on communities, it’s significant. “It’s not just going to take a day to do, so it’s not necessarily just about increased numbers, but people spending longer and staying in the area, which is always a fundamental goal of ours. “Overseas markets in France and Germany are always looking for a new product and new things to do, and they are screaming out for stuff from us. Mr Ambrose added the aim was for the trail to be as multi-purpose as possible – including amenities for walkers, runners, mountain bikers and horse riders. He said it could be used for running and walking events and expects many of the participants who tackle the Great Glen Way every year to do the full Loch Ness 360 trail as well. At the moment, the South Loch Ness Trail stretches 28 miles from Torbreck on the edge of Inverness to Loch Tarff, approximately four miles from Fort Augustus. Once complete, the route will allow walkers to travel all of the way from Fort Augustus to Torbreck on the outskirts of Inverness. Launched in 2011, the trail follows a mixture of minor roads, forest tracks and constructed trail. The funding for the final section of the venture comes from the EU, Scottish Government, Highland Council and Scottish and Southern Energy.